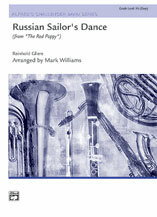 This spectacular orchestral showpiece is made accessible for young bands in this masterful arrangement by Mark Williams. Authentic in sound, yet very playable, this piece will be an exciting addition to your next cocert program. Experience the fire and spirit of this great Russian classic!